I do so love a post apocalyptic tale and they often seem not very far from the reality in these times of economic turmoil. It therefore gives me great pleasure to inform you dear reader of another tale of survival after a world altering cataclysmic event. Pressia can barely remember a time before the detonations that changed the world forever, or what life was really like back then. She lives with her grandfather behind the rubble of an old barbershop and contemplates how the world went from birthday parties and amusement parks, fathers and mothers to ash and dust, scars and fused, damaged bodies. There are a lucky few who have escaped the apocalypse in one piece, completely unmarked and these survivors are known as the "pure". Safely tucked inside the Dome that protects their health and keeps their superior bodies unharmed. Partridge is one such individual, leading a comfortable life within the confines of the dome; and yet one that is far from perfect. His only surviving family member, his father, is one of the most influential people in the society and yet is emotionally distant leading Partridge to feel isolated and lonely. His brother died last year and his mother never made it into the dome before the detonations, until one small slip of a phrase suggested she may still be alive Partridge had given up all hope. Now he will risk his life and leave the safety of the dome to find her. There is a really edgy, gritty quality to the narrative of this book coloured with the authors own unique voice, further flavoured by the sometimes bizarre and weird mutations that the "wretched" suffer. These include people fused with metal, plastic and even animals or people and yet each of these "wretched" manage to survive in some fashion. Pressia herself has a dolls head fused to the end of an arm in the place of a hand - she was a young child when the apocalypse kicked off - and this highlights the strange type of armageddon that has afflicted the world ten years prior. There is no nuclear winter or radioactive fallout but lots of mutations and mass death of plants and animals creating a strong sense of intrigue over just what happened. The story itself is not totally original, the idea of the segregated community of "have's" and "have not's" has been done a number of times in the past (as has the 2 people meeting from vastly different backgrounds), most famously perhaps in HG Well's The Time Machine and yet there are enough differences and modern idioms used to create something that does feel quite different. There are some great plot twists and the mixture of conspiracy, romance, horror and thriller do combine very effectively indeed. The book shifts through the third person perspectives of the protagonists Pressia and Partridge and other characters and any disorientation is avoided by using the characters name in the chapter heading. These shifts create nice break points and have been cleverly done to keep the overall story moving along. The description of technology and general back story are kept to a minimum, which results in a fairly even pace. One of the novels real strengths lie in it's characters, which manage to grow and develop in quite realistic ways during the journey through the story - the highlight has to be Pressia herself who manages to come across as a strong and yet vulnerable young woman who uses her wit, intelligence and pure tenacity to get her out of some really tight spots. 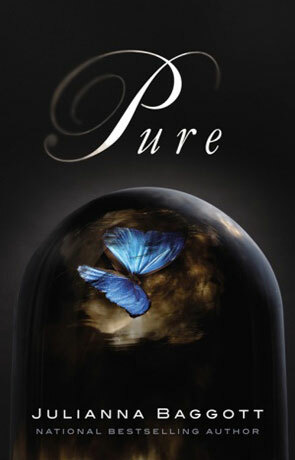 Pure has already been picked up by Fox 2000 to be turned into a film and I can see why, there is a certain cinematic quality to the prose, set against an earthy and almost grotesque nightmare world that has some very strong echo's of humanities very real haunted and relatively recent past (WWII and Hiroshima being the most obvious examples). I found this future vision quite evocative, it's very different to any of the post-apocalyptic tales I have read before, a synergy of future possible and future fiction as told by an accomplished author who usually writes outside the genre - which helps to give it that unique edge. A very accomplished novel and a bright start to the new year. Written on 2nd January 2012 by Ant.